A visit to Italy is a love affair for Americans. It has a special hold on us—cyclists or not. Even Italian Americans who’ve never had the pleasure of visiting “the old country” romanticize it in a way that would put John Keats at a loss for words. For those of us who cannot tie our grandparents’ lineage to those golden Mediterranean shores, the country still has an allure that is unmatched—a country where cycling heritage runs as deep as anywhere. Italian riders practically invented panache, and the current generation is as promising as it has been for a very long time. For the tifosi, hope springs eternal. 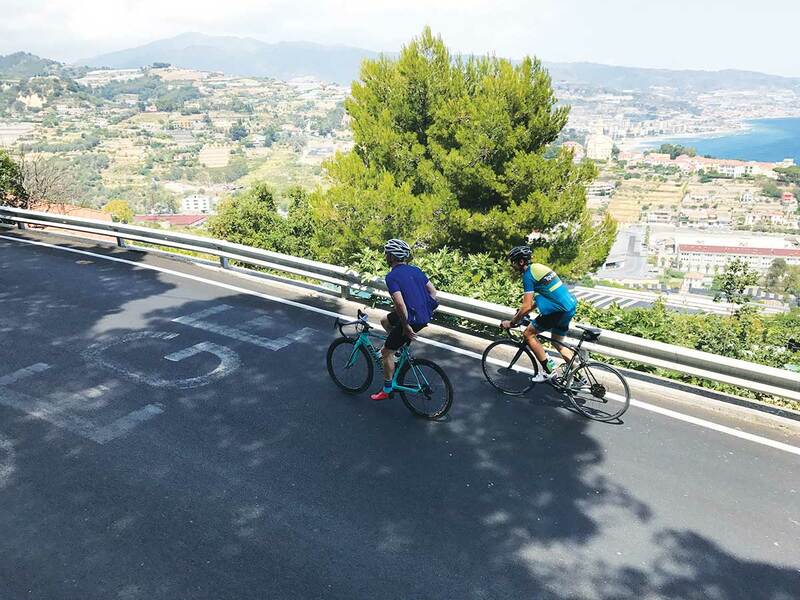 An opportunity to experience Italian culture from a bicycle should be embraced with zeal, particularly if it comes in the company of a Piedmontese who knows the place like the back of his hand. 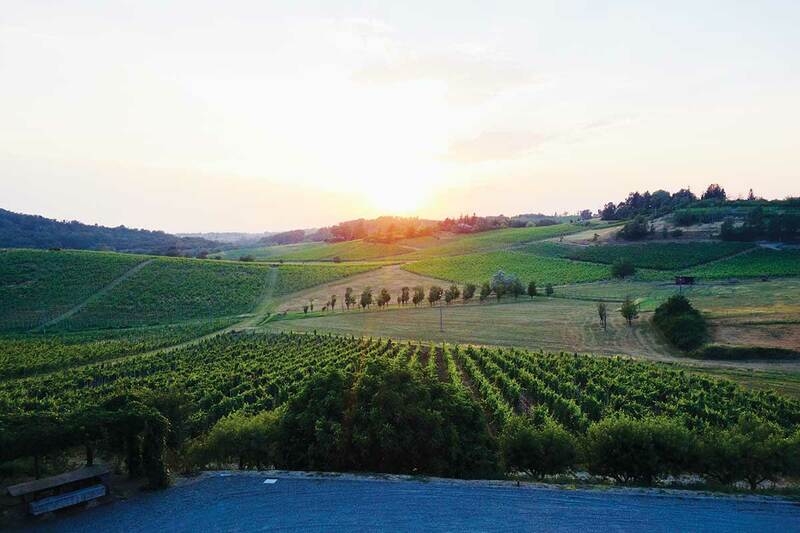 Beppe Salerno, owner and operator of Tourissimo, meets me at the airport terminal in Turin and we head straight for the hills of Gavi. Our first stop is the resort at Villa Sparina in Monterotondo. This breathtaking Tuscan-yellow inn, dating from the 18th century, perches above picturesque estate vineyards where the local white grape, Cortese, grows. There are few things that help with jet lag like a bike ride, so we head out for a short one, following the pedal strokes of a local boy who would become an international icon. These days, the steep climb up toward Castellania is smoothly paved but it’s not too hard to imagine the rough roads of the early 1930s that greeted a young Fausto Coppi, pedaling from his family’s home to the butcher shop where he worked in Novi Ligure. The roadside is marked with classic black-and-white photos of Il Campionissimo, and a mural of him and his brother (and Bianchi teammate) Serse sits on the road between his family home and a monument to his legacy. Castellania, population 92, is a fair bit sleepier than it was in Fausto’s day, when the population bordered on 500. We see maybe two people out on the streets as we head through to the other end of town, toward the Coppi family home, which remains a museum in homage to Italy’s greatest champion. The sirocco winds push us back to Villa Sparina and we end the evening watching the sunset as we contemplate the menu and the list of estate wines: sparkling Cortese and the bright-red Barbera. This is Italy, so the food is going to be unbelievable, but the course that I still think about is the local specialty: plin ravioli stuffed with beef cheek, served without sauce, simply wrapped in a cloth napkin. The morning brings blue skies, but the heat wave that has Europe in its grip is coming for us later in the day. Beppe and his right-hand man, Gianluca, are already busy when I arrive at breakfast. Maps are spread on the table in front of us and Beppe explains our route for the second of my five days in Italy, from Monterotondo to Alba. Our lunch stop will be in the bustling Acqui Terme, known for its natural hot springs, and we’ll pop in for an espresso someplace, probably in Cremolino. 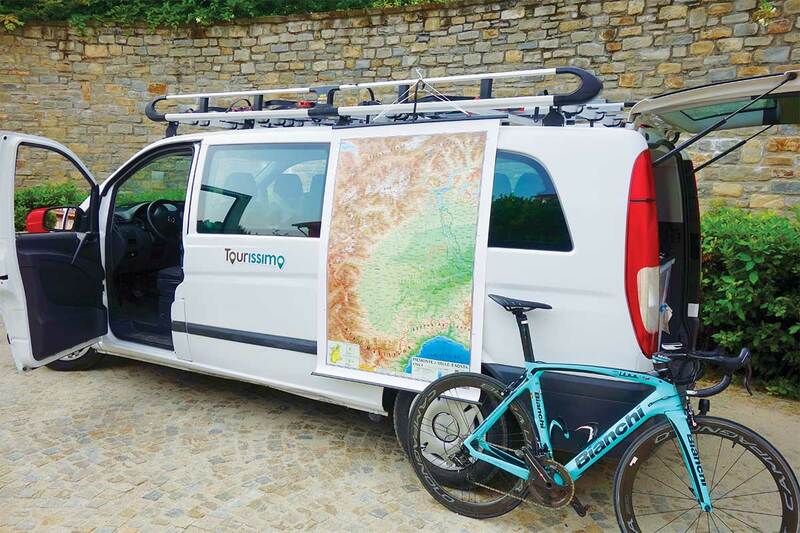 Beppe and Gianluca have been working together as cycling guides for more than a decade. They’re both from Piedmont, both handy mechanics and Gianluca has an impressive repertoire of jokes. He tops off my water bottle with ice and assures me that he’ll be nearby in the van should I need anything. We start the upcoming four days with a 70-mile ride, hoping to make hay in the cooler morning. The roads are rolling and bucolic out of Monterotondo, some quite steep, and seemingly no cars for the first 35 miles. It’s beautiful here in the foothills of Piedmont and evident that the great riding in Italy isn’t confined just to Sicily or Tuscany. Beppe has been at this so long he has a million stories. 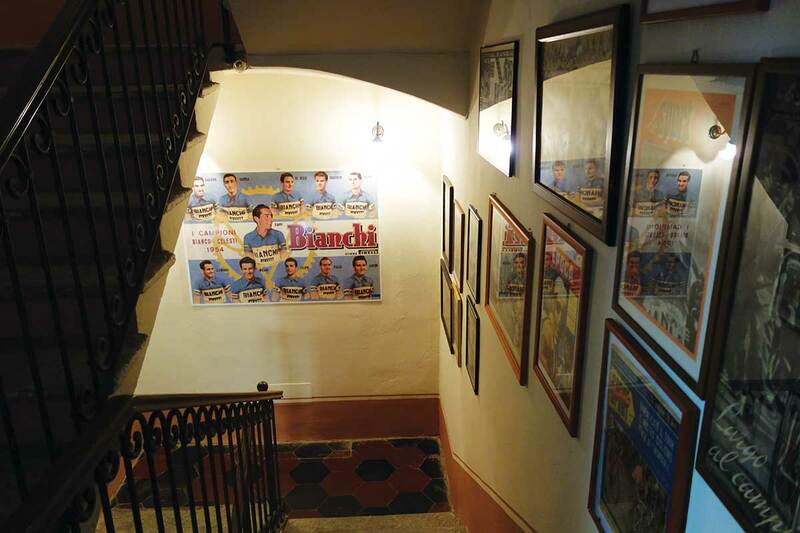 His favorites tend to be when he’s able to loop the small town of someone’s Italian ancestors into a route—show people a bit of their own history and share his love of his home country at the same time. Beppe’s got a strong engine, but the Tourissimo rides are not about training weeks or going full gas. He can match your acceleration no problem, but his hope is that you’ll actually use this experience to slow down and take it all in. Arriving in Acqui Terme, my feet feel like they’re on fire. It’s easily over 100 degrees today and both of my bottles are bone dry. I take off my shoes as soon as we stop and douse my feet in cold water. Gianluca is waiting for us and has set up a spread of fruit and focaccia…and I inhale an entire melon. The morning temperatures have given way to a cruel heat and I can be a bit delicate when it’s hot. It’s possible I could have eased up on a few of the earlier climbs. We’ve got about the same distance to Alba in the afternoon. I have my doubts, but I keep them to myself. Rolling out for Alba, it’s clear that Beppe isn’t as bothered by the heat as I am, so I do my damnedest to hold his wheel. We set a strong pace together in the morning and I haven’t yet let on that I can’t maintain it. As we approach the town of Bubbio, where the climbing starts, I can no longer fake it. The string snaps and I’m spinning on the long climb up to Cassinasco, where switchbacks can only do so much to blunt the nearly 10-percent grade. Beppe (mercifully) makes the executive decision that we load our bikes into the van at Canelli, cutting about 12 miles off our ride but living to fight another day. 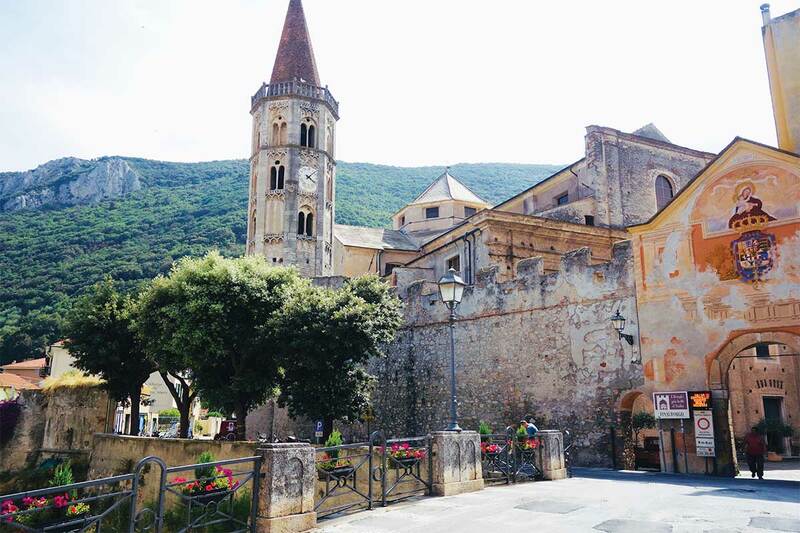 Alba is one of the taste capitals of the world and home to both Italy’s truffle business and Nutella. It sits between the epicenters of Italian red wine in the Barbaresco and Barolo growing regions. We meet for lunch with Cesare Barbero, who tastes us through the wines he’s making for his family winery, Cantina Pertinace. His family has worked with a cooperative of growers from Barbaresco to the undesignated vineyards of the Langhe since the early 1970s. 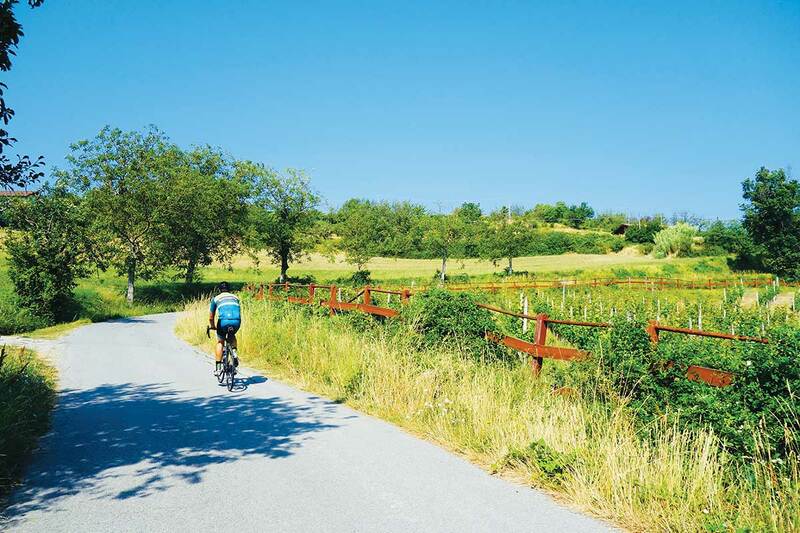 A short ride outside of the Alba city limits and you’re in Piedmont. 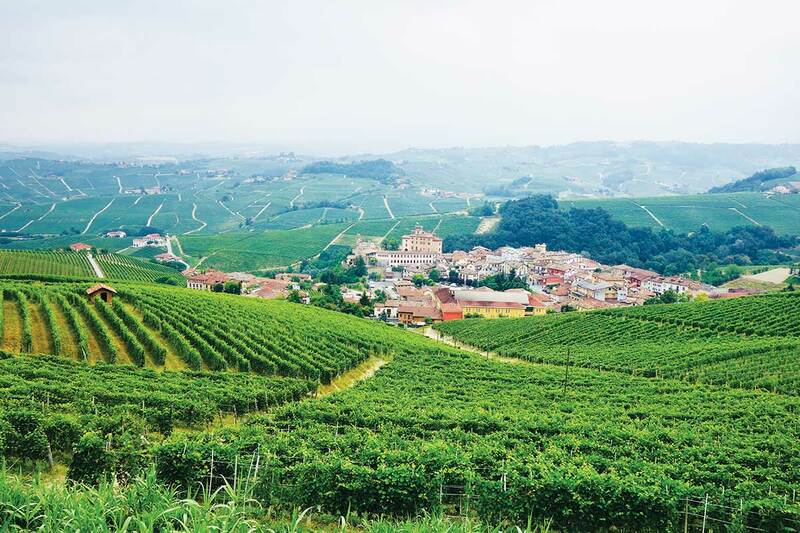 The Barolo DOCG has seen its star rise relatively recently on the strength of a substantial departure from the region’s longstanding winemaking tradition. Winemakers sought to make a more approachable, less-tannic version of the Nebbiolo-based wine, cutting fermentation times and changing the barrels they used. The result has created perhaps Italy’s most popular and sought-after wine. 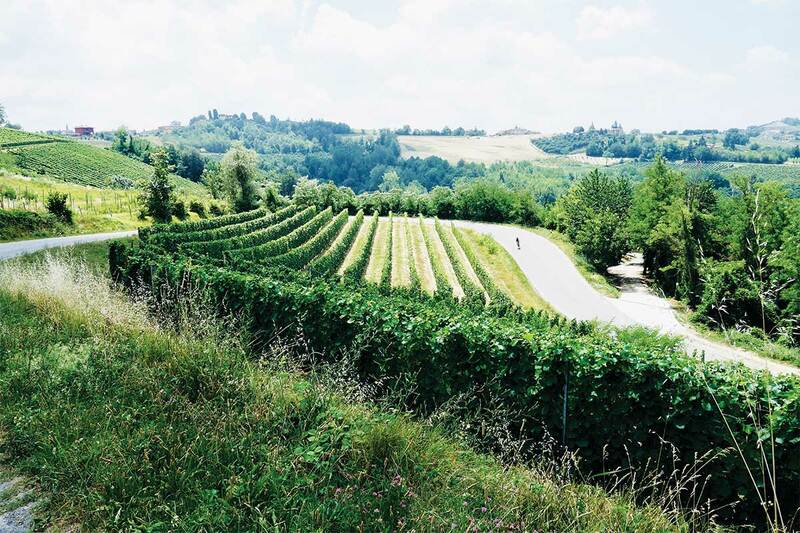 The Barolo loop is winding and well paved, allowing you to take in the breathtaking vistas and legendary winemaking hill towns of the region. Beppe and I careen up and down rolling hills between the towns of Verduno, La Morra, Castiglione Falletto, Serralunga d’Alba and Grinzane Cavour. 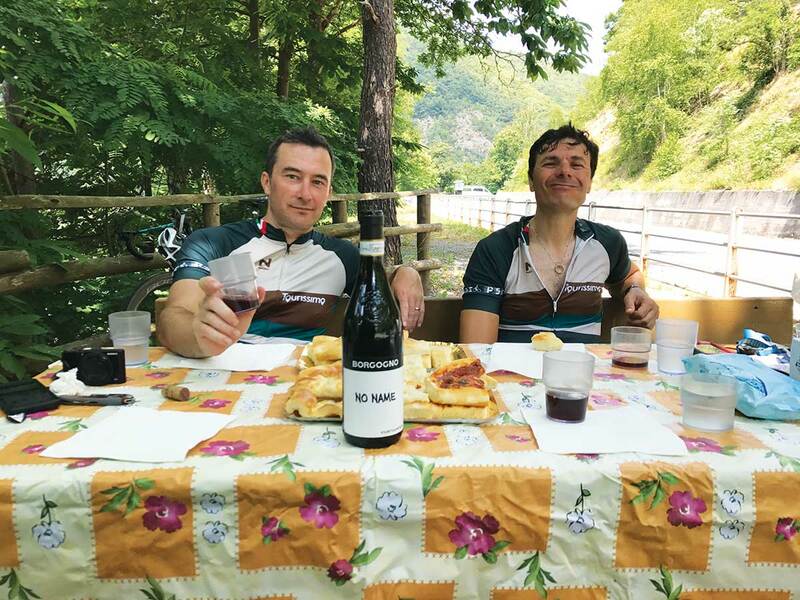 The 40-mile loop, if done right, has to include some wine at lunch and a stop for a tasting or a tour of the museum in the town of Barolo. Our day ends with a long climb out of Grinzane Cavour, followed by a short descent, that puts us at Villa d’Amelia for the evening: a luxury resort with a fantastic pool and highly touted restaurant. Chef Damiano Nigro’s culinary reputation is based on cutting-edge creativity coupled with the glory of his traditional surroundings: a Michelin-star meal to wrap up a beautiful day on the bike. Looking out at the hills of Barolo and Piedmont one last time before we head for Liguria in the morning. I assure Beppe and Gianluca that I could get used to this. The ride out of Piedmont and into Liguria is another splendid day in the saddle. We straddle the foothills of the Ligurian Alps on wooded roads where our only company is an enormous jackrabbit that crosses the road in front of us. Gianluca is waiting for us in Mombarcaro for the all-important espresso. 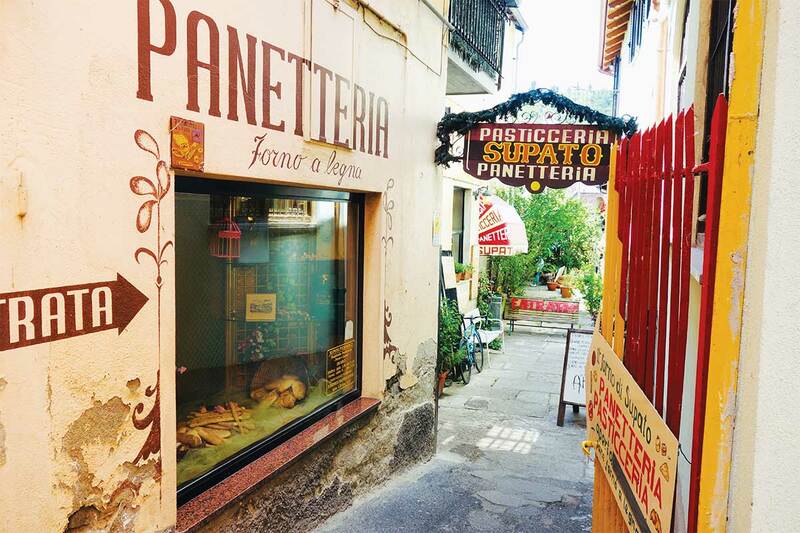 After our espresso and an endless descent into the river valley, we stop at Panetteria Supato for some sort of divine incarnation of focaccia. The small family bakery goes back generations and is so popular that a competing bakery with a similar name opened within a few meters to try and siphon off confused tourists. We pick out as much focaccia as Gianluca can carry and a few kilometers farther down the road have a picnic lunch with some wine he picked up in Barolo. We finish another spectacular day descending the hairpins off of Colle Melongo to the coast of Liguria. As we get closer to the coast, we have glimpses of the Mediterranean and, given the ridiculous hairpins, it’s best to catch only a passing glimpse. At the bottom of the descent is the storybook village of Finalborgo, dating to the Middle Ages, and a prime spot for a cold beer…or three. It is easily one of the most charming medieval towns in Liguria and the walled village still retains many of its decoratively painted buildings, including the main archway onto the Piazza San Biagio. The exclamation point of our journey will come tomorrow, climbing the Cipressa and Poggio. We spend the final evening in Finale Ligure, a beach town where throngs of Italians have come to beat the heat wave. Dinner at Alla Vecchia Maniera means tons of mussels, clams, pasta and wine. In Italy, there needn’t be a Michelin star for a meal to be perfection. My final day in Italy is bittersweet. It starts with a ride along the coast taking in the final sections of Milan-San Remo, and the end of the ride will mark the end of this journey. We stop in for a small lunch at a Ligurian winery overlooking the Mediterranean, then we hit the Cipressa and drop our more leisurely pace for a bit of a kick up the historic hill. Riding one of the sport’s legendary climbs offers you a whole new perspective. La Cipressa is ridden by the pros at high speed and culls the peloton before the Poggio. The descent is steep, far steeper than the climb, and frankly a bit unnerving at some points. It’s easy to envision yourself as Jan Raas in the 1984 San Remo, dangling from an olive tree after falling over one of the hairpin barriers. The Poggio, winding uphill between greenhouses, is accented with road paint: Degenkolb’s fans were particularly persistent as “DEGE” appears every 100 or so meters along the climb. We stop at the top, shoot a few photos with the famous phone booth and then boogie down a much faster descent into San Remo. Tourissimo does custom tours of Italy and further afield in Europe—all you have to do is ask. Beppe and his team love mixing the appreciation of wine, culinary arts and the ultimate experience of Italian culture, all of it from atop a Bianchi. Get in touch with Beppe at tourissimo.travel.